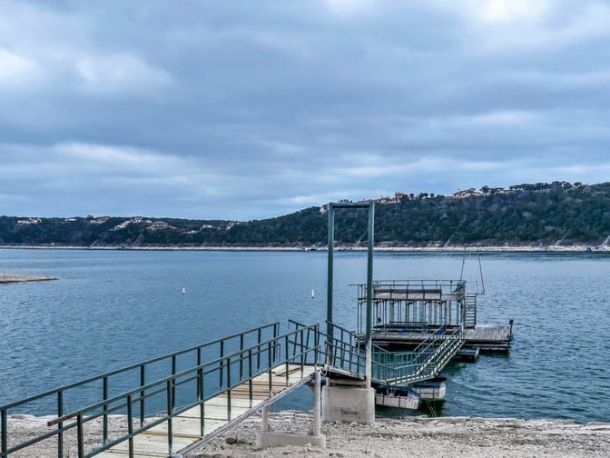 Charming escape on the shores of Lake Travis, just minutes from highway 71 – but you'll feel miles and miles away from it all. Gently-sloping 1.5 +/- acre lot is dotted with mature oak trees that frame the view of the lake and hills beyond. Designed and inspired as a retreat for gathering and solitude, 1209 Edgewater captures the prime of hill country lake life. An oasis, comprised of two structures joined by a large deck, is perfect for both a peaceful weekend or a multi-family retreat. Both are built of weathered cedar and feature stone fireplaces and large open and screened-in porches. The original bunkhouse, likely sited in the mid 50's and completely renovated in 1987, features three bedrooms, four baths and a kitchen. The covered indoor screened-porch is large enough to entertain a gathering and store kayaks, fishing poles, and room to play ping-pong. A trellis for vines stretches over the wrap around patio to envelope and cool the patio in the summer months. Lake Flato designed the additional lake house in the late 90's to seamlessly blend with the existing aesthetic. Weathered-cedar paneling and warm pine floors accent floor-to-ceiling windows that overlook the lawn and lake. A full kitchen, living room, half bath, fireplace, and a sleeping nook accommodate the lake house addition. Large lakeside gatherings can spill from the screened porch to the vine-shaded deck and out on to the lawn. A quick stroll across the grass and you're at the two-level boat dock, ready to head out for a day of adventure on the water or watch from the party deck. This is casual hill country lake living at its finest.